First off, this post is a submission to September's Japan Blog Matsuri, hosted this month by Sen over at Nippon Ichigo. Thanks for hosting this month, Sen - give'em hell! This is the third post I've written in this series, and I enjoy making these ones in particular because they feel rather personal to me. Although music begs to be shared, it also offers a very personal experience to each individual. Am I being vague enough? Good, let's move along. For this post, I've decided not to write about any big bands or artists, but about some people I know who are working hard to get there. Throughout the last few years, I've noticed that I've become a lot more indirectly involved in the practical side of music, if that makes any sense. I'll try to clarify that. I've played a few instruments over the years - clarinet, piano, guitar, to varying degrees of skill...but I never chose to pursue any of them beyond anything more than the level of hobby. But these days a lot of the people close to me are musicians; not in the sense of simply playing music, but in the sense of pursuing it professionally. Strangely, they are all connected to Japan. Back in university, I was friends with this guy who I met in my Japanese class. He was an older fellow, late 20's, who had halted his college education some years back to try and make it big as a musician. When I met him, he was still with the band but was trying to reboot his education by enrolling in part-time studies. He was the first friend I ever had who was properly "in a band." I went to a couple of their shows - he was a guitarist for a Dream Theater-like progressive metal group. I imagine he's still with them, trying to make it big, but who knows? We had a falling out of sorts a few years ago and stopped talking. Then there's our resident J-Girl Adventurist, Gobbler, another friend of mine from university (who was in the same Japanese class). We also studied together for a semester at Sophia University in Tokyo. These days Gobbler is bassist for a Philly-based Indie rock band. When I came to Japan, I met Dylan, our resident vegetarian. Dylan was putting himself through grad-school in Osaka while trying to build a name for his band, Ihounokyaku. He still is, though now he's on scholarship. Through Dylan, I met and became friends with his bandmate, Sammy. Going to their shows over the past couple years, I've met a fair amount of musicians and gotten a closer look at the inside of the music scene. Dylan and Sammy were featured a couple years ago on a TV show about new bands. Last, but certainly the most impactful now, there's my girlfriend, Yoshie Hatano. We had our first date 6 months ago from Friday! Yoshie is a professional pianist. Talking to her everyday, being around her when I can, and going to some of her shows, I've seen how hard she works to improve and to get exposure. 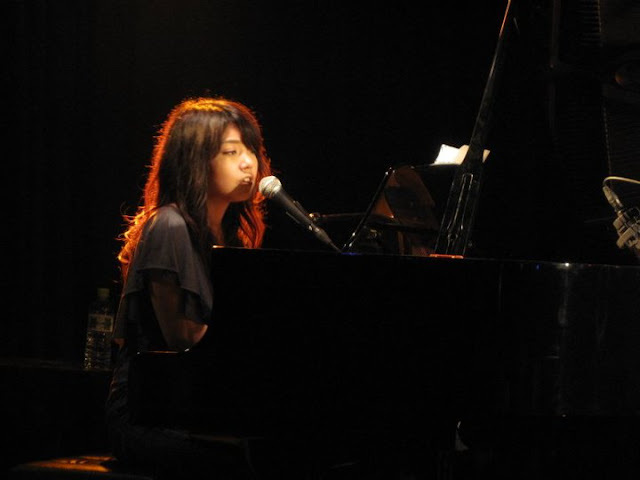 Gigs can be tough to get, so she plays piano at a club 6 nights a week, and additionally works at a cafe here and there...on top of doing shows, weddings, and whatever other work she can get. She's probably one of the hardest-working people I've met. But I suppose that's what it takes. Making it big as a musician is tough no matter where you live, but imagine living in a country roughly the size of California with a population about a third the size of that in the U.S. Here's a show Yoshie played at this summer. She was asked to do a short solo session and played these songs off the cuff. One of the biggest challenges I've observed for musicians in Japan is the fact that at most venues here musicians actually have to pay to play. Of course there are some paying gigs, but usually live houses and some bars will require musicians to pay a certain amount to perform. Then they can sell tickets to people to try and get some of that money back (or make a little profit if they can sell enough). I don't know if venues in other countries do the same thing, but it wasn't something I was familiar with until coming here and befriending several musicians. I gotta say, it's a tough game - as a musician you need exposure to get shows. But in order to get exposure, you need to spend money, which you probably don't have if you're not playing shows. So a lot of musicians putter around at other jobs to make money to pay to play. You have to really love what you're doing to work so hard. You can be really talented and work really hard and never make it big - so much of it is luck and who you know. I have a lot of respect for these people. If you live in the Kansai area and would like to check out Ihounokyoku, you can leave a comment or send us an email asking for more info. Likewise if you live in Kyushu and would like more information about Yoshie's performances, let us know! Have you been to a live show in Japan? Are you an aspiring musician either in Japan or in another country? If you, please share your impressions and any interesting experiences or insights you've had! I genuinely love going to Yoshie's and Ihounokyaku's shows. And it's not just because we're friendly. I would pay Japanese prices for CDs of theirs. That's roughly $400 a piece. They're enjoyable - usually meet some fun people. I'd like to see Lieko play with Yoshie someday - I hear she's pretty good, too. Gee, Paul. I saw you! You're in that TV clip about Dylan & Sammy! You made it to Japanese TV in your first year there, whereas not ever on American TV. Interesting. When I saw your cover pic, I thought your girlfriend was some pop artiste. And she plays great music to boot! Good one. Thanks much! She'll be happy to hear that.